Compared with other materials, aluminum alloy mold has the advantages of light weight, good processability, high temperature resistance and good wear resistance. 6061 aluminum sheet is widely used in mold manufacturing, injection molding and blow molding, can be used for low pressure mold, rubber mold and other mold industry in 80% different products, it is also known as aluminum mold. 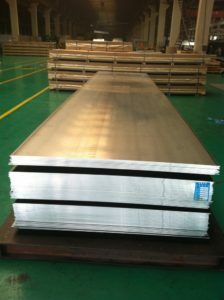 6061 aluminum sheet is generally used in the 6000 series of thick aluminum sheet. haomei aluminum production of aluminum mold 6061, the thickest can be done 600mm, width of 3000mm, to meet the needs of a variety of mold industry. The O and T4 states of 6082 aluminum sheet is suitable for bending and molding of the occasion, the T5 and T6 states are suitable for the requirements of good machinability. The general mold use 6082 aluminum is medium thick aluminum plate, some specific processing need to use the chip separator or other special technology to help chip separation, are widely used in mechanical parts, forging, commercial vehicles, railway structures, shipbuilding etc.